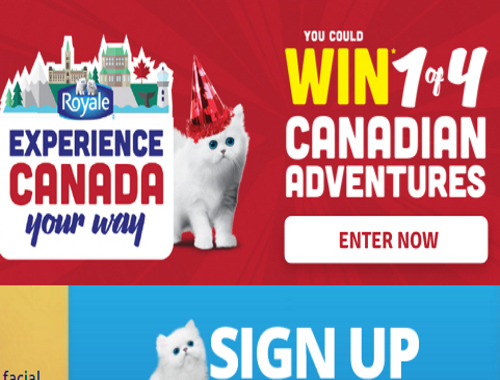 Royale wants to help you celebrate Canada's 150th birthday! You could win 1 of 4 Canadian Adventure weekends! Plus there are over 150,000 instant prizes to be won with a Pin, Get your PIN on specially marked packs of Royale. Contest closes July 1, 2017 for non-Pin entry and December 31 2017 for the Pin entry. (ii) Instant Win – PIN required for chance to win 1 of 196,000 prizes (ARV $3 to $500 CAD). Overall odds 1 in 23 – closes at 11:59:59 P.M. ET on Dec. 31/17.